The Gitzo G1548 Carbon Fiber Tripod provides a rock-solid base for large and heavy camera and lens setups including a Canon EF 600mm f/4 L IS Lens mounted on a Wimberley Gimbal Head. If you have not already done so, read the Gitzo G1327 Carbon Fiber Tripod Review to become acquainted with the Gitzo Carbon Fiber Tripod Line. While the 3-Series Gitzo can adequately hold an image-stabilized lens the size of a Canon EF 400mm f/2.8 L IS Lens or a Canon EF 600mm f/4 L IS Lens, the G1548 provides a stiffer, stronger base to help achieve the sharpest image possible. The downsides to stepping up to 5-Series Gitzos are the price and size/weight. If you do not need to carry your equipment too far, the Gitzo G1548 Carbon Fiber Tripod will perform somewhat better. The 5-Series Gitzo Carbon Fiber Tripods are not available with a center column, but the G-1518 Mk2 Carbon Fiber Rapid Column can be purchased as an accessory. Using a flat plate base alone will give the most rigid setup, but my experience with the Gitzo 3-Series Rapid Column has been quite good. The G1548 extends to 58 3/4" and can be positioned as low as 5 3/4" (no, I didn't miss a digit). Retracted, the G1548 measures 23.25". Total weight is 6.75 lbs. 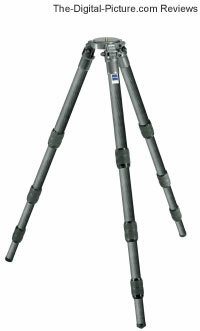 The Gitzo G1548 Carbon Fiber Tripod has 4 sections and rubber feet. Note: The G1548 has been replaced by the Gitzo GT-5530S Systematic 6X Carbon Fiber Tripod.